“The holidays…time to give thanks, spread joy and shop for the best sales. Now, here’s the perfect “gift” to help you stretch your holiday dollar. Volkswagen Credit is offering you the opportunity to ‘skip’ your December 2006 payment on your current account listed above. Upon receipt of your extension agreement, we will assess your account a $25.00 extension fee, payable on your next due invoice. There is no need to send money at this time. In other words, skip this “holiday” payment because you don’t have enough money to pay it and buy your Christmas gifts. That’s fine! Just go buy those gifts that you explicitly can’t afford. Also, we’llchargeyou$25laterbutdon’tworryaboutthatrightnowit’sChristmasafterallhappyholidays!!! First, click the images to read the full text. It’s unreal. “Why Not Skip a Payment This Holiday Season?” How about Why Not Stop Being Predatory Jackasses and Stop Mailing This Kind of Thing to People, of Whom I’m Willing to Bet Predominantly Lower-Income People Will Reply? See, I can use caps too. Some marketer is feeling very proud of himself, but I’m just full of pity and derision. Also, guys, take some responsibility for yourself. If you get offers like these, throw them away. (Unfortunately, the people who actually did this “deal” are probably not reading personal-finance blogs.) Better yet, send them to me so I can make an example of them. “Why Not Skip a Payment This Holiday Season?” How about Why Not Stop Being Predatory Jackasses and Stop Mailing This Kind of Thing to People, of Whom I’m Willing to Bet Predominantly Lower-Income People Will Reply? So, your contention is that poor people are stupid? That’s amazing. I doubt folks will even stop to consider the effect a month’s worth of unpaid interest could have on the balance as well. PS: You might want to bleep out that account number on the coupon portion of the form. Huh: Oh yes, I’m sure that’s exactly the point being made. A gold star for logic to you! They list $15.00 as if that’s your actual payment and make it difficult for you to find the amount you actually owe, if you can find it at all. Then you can’t get any help to find out how you could pay only $15.00 and get away with it. So, you think offering to skip one payment is bad? Try MBNA, where you can skip them all! I’ve seen this type of thing before with both credit cards and car payments but they usually don’t charge a fee. VW has taken it a step further by trying can screw you over twice by continuing to accrue interest for the month of the “skipped” payment and by charging you for it! I also find it disturbing that they use the word “skip” when they should really say something like postpone or delay. At least they mention the $25 fee in the letter, I’d expect intrest to accrue, but not an additional fee. Hopefully most of the people that receive this will be turned off by the obvious fee. Then again anyone reading a personal finance blog probably doesn’t finance a new car. Chase Auto Finance sent me a similar letter when I had my auto loan with them. I have heard about other lenders also following suit. Unfortunately, I think this is fairly standard practice. I’ve been trying to do some analysis where the person had a really high car payment, a low rate on their auto loan, and a really high rate on a considerable credit cards debt. Even in that scenario, the $25 is way more than the interest differential between a penalty rate card and a great car rate. For instance, even if the person has a 30% CC rate, and a 6% car rate (making the interest spread 24%), their montly car payment would have to be greater than $1250 to break even. Does VW sell that expensive of a car? I think the $25 “fee” really twists the knife in the back. Like it’s a privilege that they’re offering this, and if they didn’t charge you then they’d be losing money when really they’re gonna get increased interest payments from the extended period anyway. With that they’ve already hit their goal of making some more money off their auto loans while disguising it as being nice to customers who are in a financial crunch at this time of year. Bravo. Check out condition #2. Your contract is going to be extended for a month, but if I’ve done my calculations correctly, at the end of the contract, you’ll be paying interest on the skipped payment from the skipped month to the end of the contract. At the start of a 5 year contract that could be a fair amount of dough you’ll have to pay at the end of the contract. I think you are being a little bit too cynical. I would wager that December is the month that most car payments are not made. People with money management problems will often choose poorly between paying their obligations and buying new stuff. Most lending companies have a loan extension program where you can pay a fee to have this month’s payment moved to the end of your loan. Often the fee for this is less than the late fee for missing a payment without notice. This program is just not well advertised. What it looks like VW is doing here is letting people know about this program. Now while the smart money thing to do is to anticipate the cost of gift giving and save the money in advance, the really dumb money thing to do is to skip your car payment, get a late payment, risk repossession and its fees, and buy presents for other people. Somewhere in the middle of those two options is ask your lender for a contract extension on your loan. I have seen this tactic used by many financing companies. I would assume it is used by the majority of fianciers out there, so it is kind of unfair to single out volkswagon on this. I don’t know which is dumber the letter or your friend who decided to finance instead of pay cash. I would think that some people can’t pay cash. And if the financing is low enough (below 5% say), it’s worth it to finance it. I agree that it’s weak, but that they are “targeting stupid people and trying to rip them off”…you could say that about a ton of advertisements and sales pitches. I think there are better examples. Some people have larger car payments so it’s less of a % of the payment to accrue while you are trying to get through the holidays. As was said earlier the REALLY smart people (allowing for some cases where it’s not possible of course) would pay cash in the first place. Not sure how common this kind of tactic is, but it’s the first time I’ve ever heard of it. Thanks for posting the scans of the letter, too. Boycotting VW cars because their finance company did this is rather dumb. Maybe you should boycott their finance company and finance your car through your bank or credit union. I agree this is a very shady thing for VW to make extra money. Although some people who are not financially wise will take this and see it as something smart to do. I mean is giving gifts really this important, or couldnt you find a cheaper alternative for gifts. What would you guys do if you were VW CEO? is this bad business?? Another reason to stick with Toyota! LOL — just playing around (although it’s true I don’t like VW cars). But seriously, this is a bad offer. Lazy Man, you boycott Lexus? Ah, but Lexus is so awesome! VW does indeed make amazingly crappy cars. Silly me for buying what I ‘wanted’ without doing any research! I worked for a large bank (one of the top 5 largest by assests held) as a bill collector when I was in college. This was an extremely common practice and sometimes there would be no fee, or there could be up to a $50 fee. It depended on what kind of offer they got. But, the greatest thing was that a person could defer 2 months in a row, and do this once a year, up to 6 total times during a loan. So you would get people that would defer 2 payments like clockwork every year until they hit their 6, and when their loan finally came due wonder why they had this huge final payment. Hint, it’s the interest on those 6 payments you moved to the end, because deferring a payment means your principal balance stays higher for a longer period of time, making the bank a lot more money. I would explain this to anyone who asked for this deferral (I couldn’t tell them no if they wanted to do it and qualified, but I wanted them to know what they were doing). The sad thing is, most people didn’t understand what I was trying to tell them. I learned a lot about interest when I worked there, and I found out that a lot of people know very little about how a loan and interest work. So VW isn’t alone in this practice, a lot of places do it, and they do it because it makes them more money. Unfortunately, a lot of my coworkers didn’t understand what would happen, or wouldn’t explain it to the customer. It was a popular way to bring their account current, so to just get off the phone (because how many people you talked to was one of our goals), they’d say “You can skip a payment and pay one payment now, and that’ll make you current, what do you say?” It was sad. There are a lot of other things about that job I really didn’t like (like telling people how much they were accruing daily in interest to get them to pay, hint if they made a payment, it didn’t drop it that much, but they’d pay the collector would make it sound like the $20 a day was because they were late on a payment). Be careful what you do, but all bill collectors aren’t bad, they can give you some good advice. It’s the banks that train them how to collect. anything too good to be true is usually too good to be true…it is only too good for them if you subscribe to IT! And why only single quotes around the word ‘skip’? It’s only a half lie? Hey, I wrote an article about this last year! 🙂 I received a similar offer in the mail and it just ticked me off. I immediately sat down at my computer and wrote the article. I think this is part of what you might call “predatory lending”! That’s very similar to letters I’ve received in the past. I have an auto loan through Fifth Third and they have sent letters like the VW offer to me. The offer is bs in my opinion…we value you so much, we’ll allow you to skip a payment. Oh by the way, we’ll charge you a $35 fee and still accrue your interest. Nice! Unfortunately, I would have probably fallen for this myself. I do not consider myself stupid or of poor income, I just often fail to read the fine print. I also have poor money habits (things are looking up now that I read this site… for example I have a Roth IRA now at age 25). I think a lot of people are like me in this way and it is sad (but smart business) that marketers pick this time of year to pull some shafty moves like this when people are at their most distracted and in need of money. Keep bringing things like this to lite for our generation Ramit! Hopefully we’ll become more money savvy than the generation before us. Ramit great post. Yeap, You can see it on most credit cards given my major banks like Citiigroup,Bank of America, or Chase Mahanttan. If you miss a payment, your interest rate goes from 12% to 18% and if then to 24% plus you are tag with late fees and over the limit fees too. I called them THUGS WITH MBA’S. The ones writing the programs and marketing probalby went to an Ivy League School. This practice reminds me of servitude indenture in the 1400’s in Europe. The peasants work for survival in the Lord’s land and they could never pay off their debts. While I agree that this is a terrible deal, I think you are blaming the wrong party. The consumer is being marketed to and has a responsibility to read the offer. The letters I have seen spell out what a terrible deal it is and all you have to do is read. 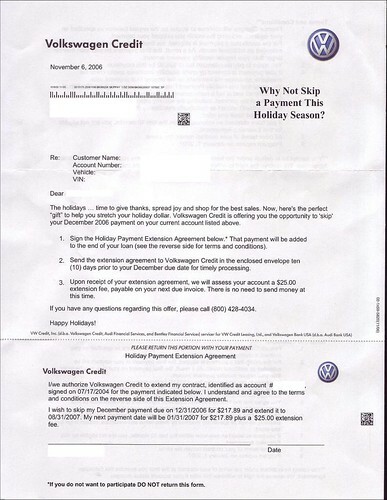 I think if VW wrote “Dear Dumbass” I would like to screw you by taking $25 to allow you the privilege of skipping a payment,” many people would still take the bait. People need to have some personal responsibility for their actions. for me, financing my car was one of the smartest decisions i have ever made. i had the money to pay cash, but instead opted for 1.9% financing – i mean, inflation is 3%, so automatically i’m winning by paying back the loan with cheaper dollars. also, i was able to invest the money into a good mutual fund and make several times that 1.9% return. i’ve also boosted my FICO/auto FICO score by showing that i can make payments on a debt over a long period of time (5 years). it’s all situational i guess, but i think that in a lot of cases, if you have the cash to pay for a car outright, you’re probably better off financing. While I agree that this is not the best deal and is indeed a ripoff you have to look at it from the consumer’s point of view. In my line of work I have given advice to ignore those offers for the very reasons stated in the other posts. However, most of the individuals that actually took the offers were dealing with cash flow issues. They completely understood that they would eventually be paying more for the term of their loan but they didn’t care because they were more concerned about their cash flow at the time the offer was being extended. Again, during holiday season, this offer, for some of the less wealthy people in the world, would be very attractive for that very reason, despite the extra cost. This is what the car companies and banks are counting on. It’s unfortunate that even despite the fact that they know that the offer costs them more money in the long run they feel the need to take on such an offer to have more spendable cash at an important time of the year such as the holidays. VW is going low with this. I hate VW so much and this is another tactic by their finance arm to go with their thieving service and sales organization. You probably aren’t going to see reputable and honest companies doing this, just sleazy ones. Didn’t get one in my statement this month. It must be a targeted mailing. Then again I pay a little more then the minimum every month. So make your car payment, ignore the offer and be on your merry way. Or, if for some reason, you could use the extra car payment in your pocket during the holiday season take the offer. Yes there’s a fee, yes you will accrue interest…but at least you had the option. Businesses are only successful if they make money and retain customers. This program helps to accomplish both. Of course it’s going to make the business additional revenue, but it’s also something that MOST customers will find as, at the very least, a nice gesture even if there is a cost. People like you like to spend their time dwelling on all that is negative and not realize what it takes to be a success. These guys have it right. Didn’t your mommy ever tell you everything has its price? It’s true. Grow up and realize it. As a side note…there are multiple finance companies that run similar programs, some with fees as high as $100. You should be happy that a company actually spends THEIR money to put together a program like this for the people that can use it. If you don’t want it…THROW IT AWAY and quit your mindless, pointless complaining….you’re part of the minority. The rest of us enjoy having options. To Get A Life: This is not a “business” idea. This provides practically no value at huge cost. The convenience charge is really an interest fee, which on a $400 payment would be 75% APR on top of what you already pay. I know you think $25 might be worth it for someone to be able to keep $400 in their pockets for 1 month, but it’s loansharking. Some people are dumb enough or desperate enough to use it, but it isn’t a reasonable service. It’s just evil. They’ve already loaned the $400 at a much lower rate, why do they need to relend at 75%? Because they’ve packaged it in a way that some people can’t see. @Transcendental Success: I would tend to say that if somebody has a car payment large enough that this program would make much of a difference in their monthly budget (as in they *need* $300-$400 for xmas), they might as well take advantage of it because they are already living beyond their means. Also, $25 might be 75% apr on $400 using the simplest-case logic, but you are failing to take into account that this might be *preventing* someone from charging $400 on their credit card @ 20% interest. This can be further compounded if this $400 they would have charged would have been on top of, say, a 0% multi-thousand dollar balance transfer that they would have to pay off first, all the while interest is accruing on their $400 for xmas. I’m just saying, sometimes there are circumstances outside of the simplest math formula that can apply to a situation. I’m surprised VW actually charges $25 for this, since lots of credit companies do it for free. I would probably take my lender up on this deal if they offered it to me, and then deposit the extra $300 (minus the fee) in a high yield savings account and sit back and watch the free money roll in. But then again, my car loan is @ 0%, so my lender would have no real incentive to do this. well, I see we now have reason #4923 why having a car payment is stupid. I love my paid for cars. What should the fee be for skipping a payment? Is there any fee that isn’t “evil”? What if VW didn’t make this offer? What if I offered to make the payment instead? Would you pay me a fee? Am I evil if I even ask? No need to go the route of “your calling poor people stupid,” but I will guarantee you that there are a lot of hand-to-mouth middle class people out there that took the bait on this also. I am right with you on the anger at greedy corporations ripping people off. My heart pounds most ferociously at how credit card companies put the screws to everyone. I actually work for Bank of America and every year this holiday season, we get a flood of phone calls in our auto loan department about “taking advantage” of payment deferments for auto loans. This is not something we offer for the “holiday” season or approve of, but because customers have been used to their other auto loan companies, they expect us to do so. Now, let’s have a little lesson about how interest in an auto loan is calculated (which is why I don’t like them). A lot of people seem to think that interest is based on your payment amount. That is wrong – it just so happens a little interest comes out of your payment, but that’s not how the finance (interest) charges are calculated. 17850.00 * 8.90% or 0.0890 which gives you a figured of 1588.65 this number is then divided by 365 days in the year. So you take 1588.65 / 365 which gives you a sum of $4.35 being charged to you in interest every day until you make your next payment. Now, bear in mind you haven’t made a payment since Nov 1, so you’ve been accruing $4.35 per day until December 1st. Now, they are offering to defer that payment where interest keeps accruing until your payment in January. So, when you make your next payment, you will accrue 60 days worth of interest totalling a A WHOPPPING … $261 in interest/finance charges. If consumers knew this or could comprehend this the first time around, you’d see less people going for these deferments. Not to mention you pay additional interest at the end of the loan since it was deferred. Not smart. Just not smart. Yet, since I deal with customers on a daily basis, I get the brunt of this, but hey I’m not the one who begged to get a payment deferred. It’s not advertised by us, but people want it anyway then are surprised later on. #42 – I used to work in collections for a bank and they taught us the same thing. We should use it as a collection tactic that you are incurring $4.35 a day if you don’t pay. It’s not lying because it is in fact true, you are incurring that much, but it is misleading. You will incur almost as much interest even if you make your payment, because the amount applied to principal isn’t enough to drastically drop the interest per day. The bulk of that interest would be incurred even if they made their payments on time. For simplicity, let’s say they make their first payment on time and $200 goes to principal. This reduces their balance to $17,650. We’ll also assume they skip the next payment. So for the 60 days, using the same assumptions above, they would incur $4.30 a day, so $258 total, which is $3 less than above. What people don’t understand and what kills them is the interest that accumulates on this $3. Most people assume that if they make the stated payment each month that they will pay off the loan. They assume that 12 payments of $300 means they need to pay back $3600 by the end of the 12 months. This is incorrect. That $300 payment assumes that each payment is made on a specific day, usually your due date. If you pay in your grace period every single time (5 to 10 days late, whatever), your last payment is going to be $300 PLUS the extra interest incurred because your principal balance didn’t drop when it should have, plus the interest incurred on this extra interest. Another thing that happens with deferring payments is that sometimes your loan isn’t extended. Let’s say you have 12 payments again and you skip one. Some banks don’t add another payment date to your loan repayment schedule, so if your last payment was supposed to be October 1st, and you skip one, you don’t get another payment on November 1st, you instead have your normal October 1st payment PLUS the payment you skipped due on October 1st. Your last due date is your last due date, regardless of how much is owed. That is the date when the balance of the loan is due, no matter what it is. A lot of people had a tough time with that, because they thought if they made their monthly payment they could keep paying like that indefinitely, which wasn’t the case. When your time is up, your time is up. The interest examples above are not correct. You are only paying additional interest on the additional principal balance not paid by skipping the payment, not the whole loan balance. As an example, say the the payment is $217 and the interest rate was 6%. If you paid the $217 payment, some would go to principal and most would go to interest. To make an easier illustration, let’s assume you paid additional interest on the WHOLE payment of $217. The monthly interest on $217 @ 6% APR is $1.09 (6% annually is .5% monthly). Therefore, if you skipped this payment, you would pay an additional $1.09 per month over the remainder of the loan. If the APR is 9%, then the additional monthly interest would be $1.63. Therefore, one would have to decide if skipping the payment is worth the $25 fee, plus the additional dollar or two per month that would accrue. The example in #42 above is simply not accurate. It assumes you’re paying additional interest on the whole loan. You didn’t expect the loan to be interest free, did you? There was one black volkswagen driving fast and I just passed that stupid car with my Audi. On a signal light, we stopped. As soon as the light turns green, that stupid car just tried to ran off. Of course, I yielded. That car is not worth to race. I then got behind him and just passed so easily. That car tried to follow me, but he couldn’t. Of course. Your car is volkswagen. Not Audi. Stupid. Ha Ha Ha. If you can make payments and keep your capital you are still making money (not much). Unless your brokerage APY drops below the loans APR. This article is an eye-opener. It’s funny how naive some firms think their customers are. Let’s not forget that when it comes to car loans, any extra interest you accrue takes into account the original loan amount (the principal) when calculating how much extra interest they tack on, regardless of if you’ve only got a few months left on that loan. Thank you VW for my good credit. Skip a payment should be done to save your credit. A few months of things being difficult shouldn’t be turned into 7 YEARS of credit problems. payment program is no good as a blanket one size fits all statement. I have a loan with VW. After 16 months with them they have never mailed me an offer to skip a payment. I have a 36 month 0% loan (yes 0%). If my payment was $400 and 5% this letter would be no different. I needed to cut down my monthly bills for for 2-3 months. (NO THIS WAS NOT AN ARM LOAN OR ANY OTHER SUCH BS!). After almost two years this went from hard to almost impossible. I called VW to ask them if they had any kind of program to skip a payment. They did. Pay 10 months on time and you can skip one or two payments (your choice). Fee is $25 per payment. I took the two payment option. BTW, I also called Chase and Citi Bank about other loans. They told me to call their collection departments after I was 90 and 60 days late! I then called Home Street Bank on my home loans and they told me to call back after I was more than 90 days late and less than 120 days late! which is the better choice?! I have credit scores of 722, 728, & 741. (back in the days of TRW’s “Credentials” monitoring service). Paying $25 per payment skipped with VW has helped me keep these scores. two late marks on my perfect credit (gasp), will I save? If I had missed two payments (30 and 60 day late marks!) my credit scores would have dropped under 700 and my interest rate would increase enough on future loans to cost me hundreds (PER MONTH) for seven years! If I was doing a re-fi and had a 30 and 60 day late marks paying $2500 to remove each would be a deal. Paying a proactive $25 fee to avoid this was money well spent (more like invested). off of my credit report and cost me $25 each! Skip a payment because you want to blow the money on non essential shopping or other BS? Skip it so you can keep your credit and keep your rates low on future loans? My next home loan will be 6% or less and my next car loan will be 0% (or close to it). It cost me $25 to keep these options open. Thank you VW. Well, I’d probably take the option to save some money long term (ie, bank that monthly payment less the $25 fee into my savings account) – but then, I’m not paying any interest (go 0% financing!) for the whole life of the loan, so my reasoning’s a little different!